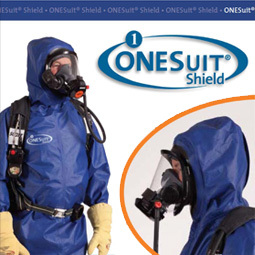 ONESuit® Shield is Saint-Gobain's latest advancement in hazmat suit protection and features a unique mask interface. ONESuit Shield® suits are Level B suits, certified to NFPA 1994 and 1992 Standards and are now available from Elliotts. Consistent with the ONESuit® brand, ONESuit Shield was engineered to meet the needs of hazmat professionals seeking the highest levels of protection. ONESuit® Shield combines uncompromised protection with exceptional comfort in a Level B configuration. Certified to CBRN First Response and Chemical Splash standards, this lightweight and durable garment provides enhanced mobility for performing the most demanding tasks. The unique facemask interface provides a vapor tight configuration for maximum protection during CBRN or splash exposure.